Gum disease does not discriminate, people such as Queen Elizabeth I suffered from Pyorrhea during her reign and has been detected even in ancient times. Gum disease or periodontal disease (Pyorrhea) is the most common dental problem and major cause of adult tooth loss. Bacterial plaque is the main cause for gum disease that creates serious infection affecting the gums and the supporting bone. Other indications of gum disease include smoking, genetics, pregnancy, certain medication use and poor nutrition. There is no pain or waring with gum disease. Gum disease symptoms include swelling, redness and bleeding of gums. Treatment of periodontal gum disease usually starts with removal of hard and soft bacterial deposits, along with routine professional treatments. When diagnosed with serious gum disease your dentist may recommend periodontal gum surgery. Surgery is necessary when tissue can no longer be repaired. In many cases people do not show signs of this disease until their 30’s or 40’s Treatments of gum disease must go hand in hand with religious home hygiene and can be prevented with a well balanced diet, regular visits to the dentist and simple brushing and flossing twice a day. Periodontal disease and gum disease are the same thing. Periodontal gum disease, along with all dental diseases, starts simply with incomplete or improper cleaning of teeth. The warm, dark and moist mouth is a perfect environment for bacteria to grow. These germs are disease causing organisms which cause bad breath (halitosis), tooth decay and periodontal disease. Periodontal gum disease has four classifications according to severity. 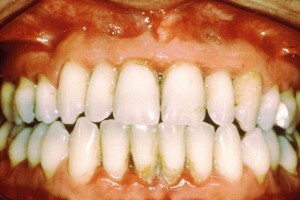 Type IV – severe or advanced periodontitis. What is Pyorrhea? Pyorrhea Alveolar is the last stage of periodontitis. 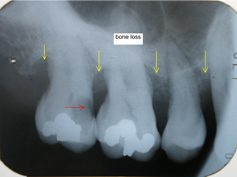 Bacterial infection and the flow of pus can waste away the bone surrounding the teeth. This disease process has been known for more than 2,500 years. Ancient dentistry tried to retain teeth by constructing dental appliances made of gold. Today’s dental care has shifted to prevention of pyorrhea (periodontitis) by mechanical debriment and antibacterial oral rinses. How to treat? Treatment of gum disease may include antibiotics. There are antibiotic mouthwashes that are used to treat gum disease. These antibiotic mouth washes go under the name of Perioguard, Peridex and Chlorohexidine. Another way of treating a localized gum disease is with a periochip or Arestin. There are multiple signs and symptoms of gum disease including redness of gums (inflammation), swollen gums (edema), bleeding, tooth mobility, receding gums, mild pain, food traps, bad breath (halitosis) and a bad taste in the mouth. Halitosis (bad breath) occurs when oral bacteria breaks down food between teeth and on the tongue that gives off a foul smell like hydrogen sulfide gas. Bad breath can be treated by brushing your teeth and tongue frequently, flossing to remove hidden food particles, drinking water to keep your mouth moist and regular dental checkups. Bad breath that does not go away can also be a symptom of other illnesses such as chronic kidney failure, cirrhosis of the liver, diabetic ketoacidosis, lung infection, sinus infection or Sjogren Syndrome. If you are experiencing any of these symptoms feel free to call Dr. Sebastian to make an appointment for treatment of this common disease at our Huntington Beach Dentists office (714) 375-0959. To make a Gum disease or periodontal diseaseappointment today please call our Huntington Beach office (714) 375-0959 and our staff will gladly help. Gum Disease or Periodontal Disease is a serious problem that can go advance from bone loss on to tooth loss. Don’t put off timely treatment, call (714) 375-0959 today to set up an appointment.